A user-friendly and super fast WordPress Magazine Theme with a clean and sophisticated layout and design. It is fully responsive and elevates your content on small smartphone displays all the way up to large desktop screens. No matter what industry or topic your publication is covering, the Rich Magazine theme levels the playing field and gives you the advantage over the competition – you know, the really successful sites, the ones with $100k budgets for website design and development. 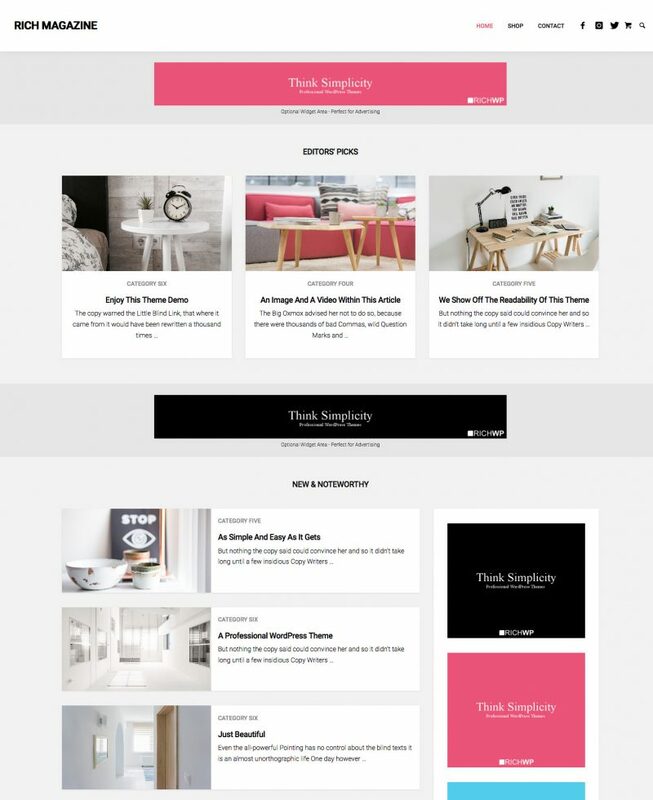 With the Rich Magazine theme you will play on the same level and crush competitors with a speedy, highly functional and professional looking site. Upload your logo and change the lead colors or the navigation background color to customize the look and feel of your site to fit your corporate identity. Select articles/posts for the featured section by simply using the WordPress “sticky post” function and select featured categories (check demo bottom) via your widget editor. Pure performance with just the right amount of features, just like search engines love it. Installing the Rich Magazine Theme is as easy as it gets. Check the Installation & Setup Guide no need to break into a sweat. Get your site elevated with the Rich Magazine Theme today. Your success will be accelerated. It′s your turn to make headway!